One of the challenges to working online is the huge number of choices we have. While more is sometimes better, when it comes to choosing which tools to use to run or establish your online business, things can get confusing … fast. Take autoresponders for example. There are countless companies selling autoresponder services, more sites selling autoresponder scripts, and even more “back office” situations where an autoresponder is built in. But you really only need ONE autoresponder account to run your online business. When it comes to “how to” information the problem grows by leaps and bounds. Many people belong to three, four, five or even more sites all teaching the same basic concepts and principles. Confusion and information overload set in because each site focuses on one method as being the holy grail of marketing. If marketer A says that pay per click is the only way to go and marketer B says that solo ads are the only way and marketer C says that social media is where it’s at the consumer (YOU) becomes confused. As with most things in life, the choice is not either or … it’s and! The facts are different. There is no ONE method that stands above the others. Successful online marketing is almost always made up of using many methods to reach an overall goal. While solo ads are powerful, solo ads and pay per click and follow up emails and social media become an unstoppable (and very automated) way to sell any product online. The real key to success comes when you tailor ALL of these methods into a plan designed for you and you alone. That said, with so many products out there, and more being introduced every day, how can we spot a GREAT product, and avoid wasting money online? Here are the five things I look for when buying products. I hope this list helps you too. Considering the source of a product has become a MAJOR factor in buying things online … especially when buying information. My bottom line here is simplicity itself – if the person selling the information has not proven that they can do what they propose I should do I don’t buy. Simple. I need to see a track record, not a screenshot of a Clickbank account for the last six weeks. One example: There is a LARGE group of people pushing “how to make money” products who have never made a dime online. I know, because I talk to these people often when they ask me to do a joint venture. If you buy something from this group you might get your money’s worth but you might not. Even if you buy their product and then get a refund because they mislead you the entire experience will have wasted your time. And you can’t afford that. You can make more money but you can’t make more time. Here are two quick ways to know if a source is reliable. Look at their sites. If they have a hyped-up site that promises the moon, look out. Even worse, if they don’t have their own domain, run … don’t walk. If you are concerned, or don’t know the person, try to contact them. How they handle your contact will speak volumes about who they are trying to serve, you or themselves. If a site owner answers every question with “buy my product” (or worse – doesn’t answer) hide your Visa and count your blessings that you found out BEFORE you paid. You should expect real help BEFORE the sale happens. While you can’t expect them to give you their product you can and should expect them to say that they feel it will work for you based on YOUR set of circumstances. I really do tell people every week to not buy my product yet. Don’t get me wrong, I want everyone’s business but ONLY if it’s right for them. If you are not sure if a product is right for you by all means ASK. It’s the only way to know for sure before you buy and begin spending time using a product. This is an absolute essential in my book. If someone offers a 30 day guarantee, I usually won’t buy. The reason for this is two-fold. If they won’t stand behind what they sell for more than 30 days, it really does indicate that they are not in business for the long haul. It sometimes takes me 30 days just to TRY what I’ve bought. Like you, I’m busy. And the worst thing is to be busy, delay trying something, find out it won’t work for you, and then get stuck because you had to wait. Look for a rock-solid guarantee when shopping online as well as a company with a reputation for honoring their guarantee. HINT: One reason Clickbank is so successful is that they are the ones who issue refunds, not the vendor. You are always protected when buying a Clickbank product. When I say “need” I don’t mean a basic need like food, but rather, will it help me accomplish my goals? Sometimes a great product is one that saves time. Sometimes it helps you save money or make money. Some products do all three, saving you time and money and helping you make money as well. Those products usually pass the test of time. The bottom line here is simple – does this product meet a pressing need in your life right now? If yes, move forward with your decision-making process. If not, no matter how great their sales letter is, the time is not right for you to buy. This is, of course, for after you have bought, but it’s still a valid point. If you bought something that does not perform as promised, don’t just give up or get a refund. Ask the site owner for help first. Products today, especially membership sites, are somewhat complicated. Many membership sites (mine included) offer so much information that a new member can feel overwhelmed. So why would a site owner do that? In my case I want to serve beginners, intermediate and advanced marketers alike. To do that requires lots of information. This is why I created the Quick Start Guide, a trend that’s catching on among other site owners. There are many products that will work like wings once we know what they are supposed to do. If you don’t understand how to use what you bought, or have questions, be sure to ask. If you find it does not work as promised, of if you can’t get the support you deserve, return it and find something else that will meet your needs. The trend among marketers today is to create ever more expensive products. Two years ago products often cost $47 or $67. Today it’s not unusual to see $497, $997, or even $2000 priced products. If these products deliver BIG value, then the price is fine. But for MANY people, $500 is an impossible amount to spend. Before you spend your hard earned money, take a look to see if you really can afford it, and if the product is reasonably priced. Here are the questions I ask just before buying – sort of my “great product checklist” if you will. 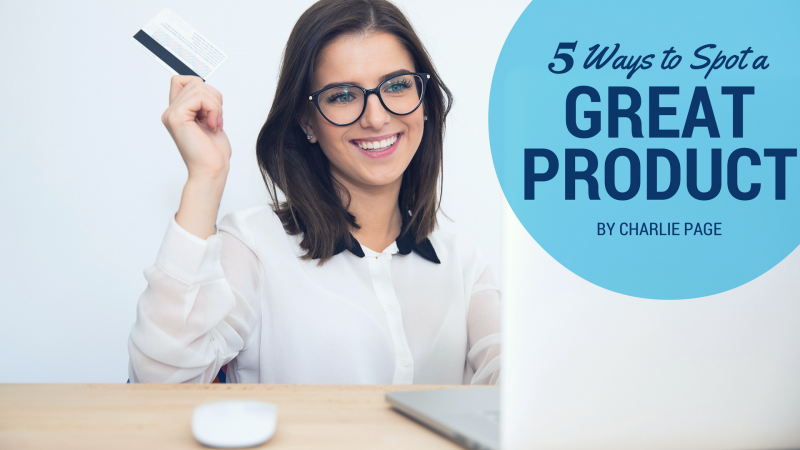 So there you have it – my five guidelines for finding great products to use in your business. Use these five guidelines when you shop online and you’ll not only find GREAT products, but you’ll pay less too. I like your article. I like bout everything you do. I work about 60 hours a week and am a member of your Directory of Ezines. I am trying to make up my mind about buying your offer for half price. I want to stop working where I am and stay home. (I am a truck driver 71 years old.) I can’t help but wonder if I will have the time and energy to do your courses. Right now, I am pretty tired pretty much every day. Not sure what I want to ask but I think it goes something like ‘Is this offer for me?’ I do not want to get it then not use it which is something I have done in the past with other products cause ‘I just can’t seem to do anymore today’. I hope this makes sense. I’m coming on 60 years old and can’t imagine being a full time truck driver. You have stamina! As to my offer, the way I feel it would help you is this – Follow Up Selling Systems teaches you to set up automated selling funnels that do the work for you while you are doing other things. We give you some fully functional Turnkey Marketing Packages as well and even build them for you. So getting set up promoting using this method takes literally hours, not days or weeks. That said, I want to be 100% clear that I know this is not a cheap price point and so it’s not for everyone. I would be all too easy to say “Yes, it’s for you!” but that would not be honest. It IS for you if you can spend some time working the system and let us do much of the work for you. I would love to have you as a member of these sites, and do feel very strongly this is a bargain and I know the sites work well for members. So, on balance, I would say IF you feel you will use it it will be a good choice. And remember, if you do purchase this offer there is nothing more to spend and you have Lifetime access to them all. And my consulting offer can be used anytime within 6 months too. It’s hard to hold back on being enthusiastic about my products, but I want to say again that if it’s right for you then I say go ahead. But if not I fully understand and will be of help in any way I can. Like you Charlie, I rely heavily on on the person who creates or promotes the product. If he’s solid, then product, service and all else will follow. Oddly enough, I also rely on “feel”, too. Am I comfortable with him? Does he seem real – genuine? Do I like his style? (Know, like, trust, right?). I know…weird, but going with my gut has served me very well, thank you very much :-). You know that I once bought one of your products before listening to your sales video. I literally ordered, then came back to the video to see what I just bought. What you don’t know is I have also bought 2 courses from others solely on your recomnendation. Sure, I read the sales letters and made sure they were right for me, but I would not have checked them out in the first place but for your endorsement. Thanks for being real, Charlie. I buy a lot of stuff. I try to set aside the sales pitch and get to the core of what is really being offered. It really doesn’t matter that he’s made millions using “this very same ___” or that his star student made $50,000 in his first month. All that really matters is, What is he actually offering, what will it do, will it help ME reach MY goals, can I afford it, and will I use it? I leave the sales page & come back later before ordering (just leave your browser open). And I actually schedule a time to go through the course before I decide to buy it. I used to buy stuff because “I might need it” and they swore it would never be this cheap again. Boy, that’ll drive you to the poorhouse! Now I try to be smart, and make a practical BUSINESS decision. Sometimes, I even succeed :-). Darn copywriters…oh yeah, I are one! Great insights. I love this part “I actually schedule a time to go through the course before I decide to buy it.” I’m actually writing an article about this that might end up being a short report. How to use, and choosing to use, what we buy is good stewardship and smart business. I wish I had read that advice when I started. So sensible. Thanks Ella. I’m just happy you have it now! Thanks for reading, and for your comment. Thank you for being that type of person in the Wild West of online business! Happy you found in helpful! Merry Christmas and Happy New Year as well. Once again Charlie thanks for sharing your professional experience.You always produce information of value.Thanks again….A.G. Thanks for those valuable points. Vintage Charlie!! One thing is sure: your products meet those criteria and more! Now retired, but going into Consulting in my 4 areas of Competencies and Passion – learning solutions, strategic admissions, life choices counseling and messaging communications – is there a product (s) available on your shelves to hasten and increase my learning curve? If not, can you package one or two for me? Thank you for providing these sterling pieces of readily usable information. Bless you. Just found this article by chance although I have been getting your emails for some time – excellent. I am going to make time to go through your other articles over the next few days. To all those marketers above that are on the fence about joining the Directory of Ezines.. I have been a member for several weeks, and every time I open the site, I find more and more good content from Charlie. This article is yet another example. Buy the DOE. You will not be disappointed! Its amazing how much common sense Charlie has to offer…. Many thanks for another fine article and for the advise you have given me via email. You are teaching me to operate this business in the right way… and at the same time I am not overloading my Visa! I appreciate all your efforts and I am looking forward to the new DOE! I am having a difficult time finding employment, so I thought I might try internet marketing. I have been surfing and receiving many emails trying to decide which ones are good and which ones are not. I am so glad I came across your sight. I have no doubt that I can do this, but have to be very careful in deciding which program to go with. I do not have the finances at this time to continue with this site, but I am going to keep you in a special place. when I am ready to do this I will return. Your information is very imformative and is going to guide me in the right direction. I want to learn all I can before I jump in to this with all that I have. Can you suggest a product for someone like myself who is just beginning that would benefit my situation? I am not looking to get rich over night, but I would like to prove to my husband that internet marketing is a true business and we both can do this and come out on top if done the right way. Your time and effort is highly appreciated. I have been receiving emails from you for some time now, unfortunately I have’nt found my dream online job as yet !!! I am writing now articles and short stories and I was wanting to know if there was a way of advertising as an Ebook for publishing online, I am a novice but have been taking writing courses to improve myself. I am going to read all your articles and take in all I need to know the proper way and would like to thank you for your time. I am now saving and bookmarking all your pages to me so I may read all that I need to know to be successful. If I could write my short stories and illustrate and put in an Ebook to promote I would be very happy but I do not know how to go about that and what to sell them for!!! remotely sounded like it would offer me the magic solution I needed. before starting the next one. It was amazing the results I started to get. As always, Charlie, and I do mean ALWAYS: a pleasure to read! Though I am not yet into online marketing,but I am beginning to learn all that I could on the subject. One aspect that I’m overwhelmed is ‘information overload’. The five steps guide line you mentioned is very helpful. Thank you very much for that advice so refreshing. I was just introduced to you this morning, around 12:35 am! I think my prayers have been answered because I have looked at, researched, constantly searching for the right program and organization to become involved. I have a lot of ideas, and just in the last two weeks trying to put the puzzle pieces together and implement them. Easier said than done, and I am sure you know what I mean! I am smart but there is so much information, anyone can easily become confused. I have been there, but I do not give up! Here I am. I have just joined a MLM, want to start my blog, and have an affiliate income on the side. More importantly I want to teach my sons, and others how to live a better life. I have been watching the Internet the last few years, and have done webinars, seminars, watched videos, and taken notes in countless number of notebooks. I have a blog on that too!! We live in an overwhelming society and I am trying to live a peaceful life and bring the joy back into my life and my family. Thank you and I will be talking soon to you! I wish you had a DOE for Holland! I found you just a few days ago, and I am impressed with your style. I appreciate the honesty that you bring to the table. I like to read your material because it is easy to understand. And, I really like the “no upsell” in anything I have read. Thank you Charlie. As reletivly new member of DOE, I am still testing the water. Thanks so much for the valuable info. Thanks Charlie – thats great – thanks so much for continuing to share such great ideas. I have just started with PlugInProfit this week and I love hearing you but I am so confused. I thought my website would be marketing my 5 affiliates but I can add more products? As you can tell I am a novice. Merry Christmas and Happy New year Charlie. I also want to thank you for your consistent email messages and all of the wonderful information. I have been trying to make money online for many months and strike out more than I really want to admit. Loh, this morning the light went on and I have made a personal commitment to become a DOE member as soon as I can afford it. Wish I have seen the light the first time I visited your site-I would be way ahead of the game by now. Keep up the great work Charlie it is very much appreciated. Hi Charlie, thanks for the info, like a reader I read above me, I also saw the 3 videos about using ezines and clickbank to promote products but have been unemployed for over 2 years, I WISH I had the 197 to purchase. Have you considered offering this for a monthly fee? I would have become a member today if that were an option. Thanks. Thanks a million with your advice. What do you do then if you are a new marketer, knowing that your product works? This might be through your past work experience, but you are new to online business. Does it mean that customers should shun away from you? that hate to write. but your leters has be so motivating, my player for you is that God will continue to grant you wisdom and more insight in the name of our lord Jesus. keep it up. I just joined you in the DOE on 12-6-10 and before the purchase and even more so now, the HONESTY and INTEGRITY just come through your materials. I would like to talk to you soon as I am having a small problem and not sure if I’ve handled it correctly. Please, keep the honesty and fourth rightness about you and your materials. I’m just starting out (two weeks along the road) and came across DoE through Kim Roach’s Traffic Dashboard. Thanks for the ebook and bonus I’ll be digesting them in the next few days. This is my first visit to your blog and I am very impressed (that takes some doing as I am a typically skeptical Brit). I’ll be taking your advice in this post and checking out the quailty of the information here and in the ebook before I commit to membership of the DoE, but from what I have seen that may not take too long. Thanks again and I look forward to chating more in the future. I want to ditto the sentiment of most of the commentators on here. The internet is filled with so much information, that even a very educated person can get lost when it comes to making decisions that can affect their pocketbook and time. My problem seems to be so common as I am sure others have experienced; too much information thrown at once in my face. Since I want to take advantage of every opportunity, I find myself jumping from one method to another while at same time wasting valuable time. “Much to do about nothing” or “jack of all trades master of none”, couldn’t be a better description of myself, and I venture to say many other internet marketers out there trying to catch lightning in a bottle. We seem to take as rule of thumb many so called gurus’ philosophies’ of what works best when it comes to making money online. One pushes social media while another swears that affiliate marketing is the way to go about it. What you say is profound, that you have to combine different methods and what works best for you and you are comfortable with in order to be successful. I value your honesty and experience on that front.. A quick anectode. Very recently, I had a terrible experience with one vendor who shall remain nameless, that offered a 30 day 100 percent money back guarantee on something that seemed case closed, slam dunk winner at the time of the transaction. In reality after a couple of weeks, it became a horror story when I attempted to implement it. Long story short, getting back a refund became an epic battle which to this day, I will never forget nor ever do business with this guy again. And we are talking about one of the giants of the industry. Not some con artist hiding behind a PO Box. But that’s how I will remember him from this point forward no matter what anyone says about him. Anyway, thanks for the opportunity to voice my two cents worth. Your DOE Site has to be the greatest sources of information for the beginner I have found since becoming an online affiliate (just a short time ago). Since I don’t have much of a “list” yet, I now feel much more wealthy in this area. You certainly know a good thing when you see one….I’ll have to remember that about you. I have just joined DOE and am looking forward to using all it’s resources…in time of course. Thanks again for the great job you’ve done in putting all these great resources together for us newbies to enjoy and learn and profit from…It’s like DOE has leveled the affiliate playing field for me, the newbie. Now I’m sure I can make this thing called affiliate marketing work and a whole lot me. After searching the internet for reliable information, on how to make money, for many years(2003+), I filled my computer. I literally have well over 300,000 ebooks. I can’t even keep them straight any more. I realized that, in the free bonuses that are offered, only parts of the puzzle are given. So I began to collect them in order to put this puzzle together. I knew that, in order to succeed, I needed to reach the right people. Now, I am broke!, so this is what I decided to do. I recently obtained 6 free websites and created them in different niches. I began filling them with content(like you, I’m NOT into hype), became an affiliate on clickbank and placed products on them where they matched content. Then created a 7th site as a hub(as you can see by going to the website I entered above), so I would only have to promote one site to bring people in, because I could promote in general to all people, not just a selected niche. A good Idea, as I thought. Then yesterday I found you. I have been reading your information and to me your words “GLOW” as if a “sign”. Finally someone who is, straight forward, honest, established, and knows what they are doing, genuinely trying to help(I’m not trying to put you on a pedestal, for they tend to fall). I am so excited to become a member of DOE, but it is going to take me another two weeks(at this point) to raise the spendable cash to become a member. I humbly ask, please Please PLEASE, wait for me to join before changing your membership offer. I WILL become a member either way(the benefits vastly out way any dues you place on it). Hi Charlie, Sorry to learn of your eye problem. Just about a week ago a friend of mine suffered a detached retina and he was completely blind in that eye. Somehow his ophthalmologist treated him with a laser and completely restored his vision. You must have a different problem. Hope it clears up for you very soon! Personally, I have wet AMD in one eye which blurs things enough to slow down reading, but I can still read! Yes, problems increase at “our” age! (I don’t know about you, but I’m 81 now!). As a friend of mine said, “Any day above the sod is a good day!” Best wishes for a rapid and complete recovery! As always i love to read your newsletters & articles & enjoy them. They are a wealth of information, sometimes humorous too. This piece of valuable advice certainly serves its purpose in educating newbies like me. I do appreciate what you have done & will continue to serve your DOE members of which I am one. Hopefully, I pray that your eye condition will heal & be restored back to normal. Could you give me some advice on how to improve this? I have been on the internet since 2000 (originially using a webtv and have my first pc) and have lost much money by my standards trying to make money with ppc schemes tha were affordable to join and promised much money but in the end never delivered. I only know trial and error means of finding a product but at least there is a voice of reason somewhere on the internet to offer advice i can agree with or even try to implement if I choose to. I have no website or definite product yet but Charlie Page is the product along with Doe I could promote. Sort of 2 for 1 deal I never imagined I could find..
Hope your eye problems clear up. Charlie I first heard about you through Vick X I wacthed 3 videos About using clickbank products and conecting them to solo ads through DOE made a lot of sence! I’m a complete newbie As I’m unemployed at this moment I cannot afford to join DOE. I like getting your newsletters And intend to join DOE as soon as I get back to work! Without question, a great article with good solid advice. Not only will it help me when searching to BUY a certain product, but I think it is also VERY good advice for an affiliate looking for a strong product to promote. Someone who´s arriving to the Internet busines world like me will, for sure, make a great use out of your advices and I am very thankful for the moment I got to know you. I really really want to thank you so much charlie about all your efforts to help guys like me. I had a lot of information that helped me. but as you said all web advertisers about how to get money online confused me. i don’t know what to do. but you know i want to try your way for this. just i need to collect money for this cause i don’t have a big wallet filled with cash. Excellent post,Great advice,thank you so much. stuff thrown at us in this “industry” onlinee…lose your head and common sense and get bogged down with disorganized chaos and time lost in the quagmire of stuff you don’t need or already have. You are so right! THANKS! I am one of your newer readers and I must say I enjoy it greatly. I started Affiliate Marketing simply by purchasing the product from who ever told me how good it was, had a quick look at it and started marketing immediately. You can guess the results?! Yeah Dismal! Often not one sale. It is information like “5 Ways To Spot A great Product” that would have saved me a lot of heart ache in the beginning. I will look forward to making reference to it within my future Articles. I have found that along with prices rising to where the medium has become unaffordable to many, a lot of the cheaper products $5 to $37, the information they offer to be either half useless or of very poor quality (not all naturally) and it seems to me the average price now is $97 to $197 to find really good value. Of course you get what you pay for, even then, that often fails to apply. To m,e it’s becoming more like… you get what I tell you to pay and then you walk the minefield to ensure you have quality and decide from there. Therefore more than ever your article and the responses you receive has become exceptionally timely for Marketers today and I have to say at this point in time just how pleased I am to be associated with you and your group of members. Thanks Charlie and thanks guys for your input. Great advice as always I have not been with DOE for very long but have gotten all the knowledge I can ask for it is my pleasure to be associated with a program such as yours. This is the article, what I’ve been looking for a long time. All is said clearly and understandable for me as not English speaking person. I am lucky – I have opportunity to have you as my teacher, my eye opener in this Internet Marketing World. I was just about to schedule a one-on-one consultation with you, but your blog answered my question. Your material always seems to read my mind, so thank you for that. I was trying to decide between several different ways to promote my business and your blog mentioned that I should do them all. Not a small task, but definitely one that will give added value to my customers and expand my ability to attract more customers. Many thanks for the help on this one! Hello ,Charlie andy thank you for these informative emails, they will save people a lot of money, if they heed your advice. Charlie, I really appreciate your honesty. I think it is very important for every serious marketer to give prospects/customers to be able to contact them. The five examples that you gave is a valuable marketing lesson for those who may just be getting started. I recently invested in a affiliate program that (like so many) stated on the front page that I would be getting this product worth $1000’s of dollars for the low price of only $70. Then as the consumer you pass through this first step only to be hit with upsells which makes the consumer feel as if they don’t invest in the upsells it would be as if they bought a steering wheel without the rest of the car. When you start add up the cost of the upsells the product really does cost a $1000. I applaud any internet market who makes it clear on the front page all the costs involved not try to bleed their buyer dry by making them invest in their upsells because they might feel that its to late to back out the front door. By the time they’ve invested in all the upsells they have nothing left to put the system to work. They complain that its a scam and the internet markets have managed to knock one more potential competitor out of the arena. I have a golden rule – never give your email details to anyone unless you match it with an unsubscribe from someone else. This keeps my information down to manageable levels. Thanks for the solid advice Charlie. As a real newbee of only a couple of months, the trap of getting on the next great thing just trying to make a few bucks to get going online is a very quick spiral. Confusion with too many things going on at once or trying to learn and implement them I seem to get part way only. So with great advice and a personal review I had unsubscribed from all the lists just plugging products each day with no real relationship built or anything of great value to me. Found the warrior forum, what a Godsend to weed out all the rubbish. I have only been on your list for a couple of weeks and already know your genuine so thank you for great advice, I have gone back to the start with a clear head and look forward to joining the DOE and head toward my target of $2000 a month. Fingers crossed. service with you that comes with it. Thanks Charlie, great stuff! What struck me most was your “great product checklist” before you buy. It’s amazing how many scams you find online. I throughly enjoyed your article. These are exactly the types of things I help DOE members with. Just a tip for everyone that I am trying to get into the habit of. Always, always, leave that offer site even if you want to purchase. I got the Auto Mass Traffic for $27, just by clicking away and getting the 10 bucks off offer. This has happened to me more than once, and I think the discounts for visitors who click away are being used more and more. I agree this is being used more and more. Site owners need to realize this because if they do not use an exit pop they will lose sales from people who leave thinking they *will* see the pop out. Great observation. Thanks for sharing. Charlie your advise is real good and honest something I can’t say so mush for some vender’s online. I am one that’s never made a dime online and the simple reason is no ones fault but my own I just don’t know how to pick a product and how to market if I had one.Anyway have a good day and I probably will talk to you later. If you are a DOE member log in and check the Member Only Webinar called Common Sense Internet Marketing. I go over how to choose the right product to promote in that presentation. Hey, Charlie! Just got your email and had to check the new article. Definitely worth the time to read–as always. I especially like your final checklist. I’m going to borrow it for an upcoming post on my own blog (crediting you, of course). Keep up the good work. Have a wonderful day. Charlie, this is really great advice. If more people followed your advice, they would be much more likely to spend their money wisely and not buy anything and everything that catches their attention. It is good food for thought. Thank you for posting this. Very Great Information On The Five Ways To Spot A Great Product. Product On Me. This Post Give Me So Much Clarity. Great post! As an info junkie I download and read a great deal of information. A few years ago I bought everything. Over time I’ve learned that no matter how great the offer, if it’s not relevant to what I’m doing now it’s not worth purchasing. I’m not sure what to make about all the “limited offers”. Unless it’s something like 1:1 coaching why wouldn’t a vendor want to sell as many units as the public will buy? Product launches are like trains. If you miss out on one you can rest assured there’s another one coming along right behind it…although the new launch format of drip feeding lots of useful content is killer. I always enjoy reading your articles. There’s something in each and every article to be learned. This one felt like it was written with me in mind. Information overload is my middle name. This helps. All good guidelines, Charlie, and I would also add ‘join The Warrior Forum’ – it’s free and they do reviews on all the major product launches, which are great to help you assess the value of the product to you. All I can say is… WOW!!! This is really good stuff that everyone should read before making their next purchase. You see… so many BRAND NEW Marketers want to get rich off people with little to no knowledge, people like them, they’ll sell you a boat with no motor and tell you to paddle upstream. I’ve learned from experience to do your research, and ask questions… lots of questions. Thanks for writing this post. I’ll definitely re-tweet. I bought your membership offer some time ago for all the reasons you mention in your blog. Before that I wasted a lot of money on useless or less than useful products and learned my lesson the hard way. I don’t comment enough on your blogs or other great info you provide but wanted to make sure to support your advice here. Keep up the great work. Has anyone ever told you that you make a lot of sense and don’t beat around the bush? Well if they have not then i am telling you now. I have been looking at joining the DOE for several weeks now but i have a dilema. One part of me can’t wait to join but the other sceptic side say’s whoow hold on not another product which may not work and the cost is a bit high, what would you say to me to get me on board. I would say this – I never try to sell anyone on joining the Directory of Ezines. If you see the value you will join when the time is right. The only real question is if you believe that what I offer at the DOE will help you achieve your goals online. If yes, join. If not, wait until you are convinced that what I offer will help you. In the meantime you can ask me any marketing question you like completely free by using the ASK Charlie link at the top of this page. Have developed a product called Partnership Dancing(tm) for How to Dance with a Partner. It is the first and only method for communicating unambiguously in social dancing. I know there is a huge need for this product, but my conversion rate has been low. Have written dozens of articles, maybe hundreds and posted them on my own websites. Will start posting them on article directories, but want to get my conversion rate up first. Am wondering what is better for converting, a website that has little on it, except to sell the product, or a website that provides a lot of articles and free content so people have a reason to come to the website often? I personally prefer to separate a sales letter from an information site. I do put very short recaps of my offers on my information blog. Use the Charlie’s Sites link at the top of this page to see an example. I feel that I know you by listening and reading what you have to say. I knew I would be a member, but having time to absorb it all is not easy. Then before having started comes the offer of Follow up Selling System. It makes sense, afterall it is what you have been doing since I subscribed to the DOE. But honestly, I have to talk to you before I do anything. I have made a phone appointment, but nothing was available before 5.oct. I am confident that your advice will help me get things rolling. I look forward to connecting with you. My schedule of appointments does stay booked up about two weeks in advance but please notice the “first come first served” call in times I keep open every Tuesday and Thursday. Those times are there for members who need to connect sooner than an appointment will allow. I have a couple of sites. I’ve been following you for a few weeks now. I’ve poored over every word. If I had the $197 I’d be a member, in a blink, and I’ll have it, one day. I could chat with you for days without taking a breath. I’ve been in online Real Estate investing for a while and have some IM strategies working for me. About 60 days ago a pushed a button, on my PC. The Pentagon should know of this button. The explosion of IM Gurus and info has been so overwhelming, I’m bewildered. You keep my feet on the ground. Thanks! To your check list of 5, may I add one more? Check whether or not the product/service has Affiliate Program. If I am happy with a product/service I would like to recommand it to others. Once again, Click Bank products are best because all Click Bank products do have Affiliate Program. GREAT note! I’ve come to expect nothing less from you after our visits. Excellent addition to my article. Thank you! Thank you for your very positive and very flattering feed back. But, do you know that actually you are the one who helped me giving you the sixth addition to your list of five. I knew very little about Jimmy D Brown. It was Jeff Gardner who had endorsed Jimmy’s “Membernaire” a few months back and Jimmy was buried in the back of my mind. But, your endorsement to his retiring “Profit Vault” revived me of Jeff’s endorsement of Jimmy and combined together I subscribed to “Profit Vault” under your Affiliate Link. Today, for me like Jeff and you; Jimmy D Brown is certainly a credible Internet Marketer. An Affiliate Program is certainly an additional stream of income that can enhance subscription to a product/service. Great advice as always thanks Charlie! I think your blog should be mandatory reading for anyone just starting out in the IM world. When I reflect on the number of products I’ve bought, and the monies spent, I know I would have saved a lot of time and money if I had followed these simple rules! There is one such thing going on right now which should be scrutinized using your criteria: AutoMassTraffic. I am surprised to see Ryan Deiss and Justin Michie promoting this which to me seems like perfect pipe dream. It is a very good idea to contact the vendor before you buy to find out whether they respond at all. Usually they don’t or you get a nincompoop reply from some assistant who just fell out of the sky and landed improperly. The other thing is of course to check their site using whois or something similar. If it is a newly created domain and only paid for a year then how good is that? You made a good point about the testing period. It might not be enough with 30 days. If SEO is involved at all we are looking at much longer times before we see any results at all. Clickbank is great. One would think they get xxxxed off if there are too many refunds on the same product? It would certainly irritate me if I was an owner of Clickbank. I am testing Auto Mass Traffic now and will be reporting my results to DOE members soon. I would not characterize it as a “pipe dream” but respect the freedom we all have to state our views. The product holds promise – testing will tell. I would respectfully disagree on one point and that is about newly created domains and them being paid for only one year. Many marketers (myself included) will have hundreds of domain names and so choose to auto-renew them one year at a time for cash flow reasons and so they can choose if they want to keep them. Many marketers (myself included) will register a new domain name for a new project. I did this last week in fact. So I would not personally look on that as something indicating the product or product owner is unreliable. That said – thank you for your feedback. All points of view are welcome. Hi Charlie, this is RIGHT ON – especially the different sections where you discuss overload and overwhelm. I think of myself as a self-disciplined person but man – now that I’ve started affiliate marketing I am SO easily side-tracked by the zillions of products coming at me, each one promising to be THE solution to getting traffic to my site traffic, autoresponders, web designers, affiliate products, list builders, squeeze pages….. there have been days when I sit down at my computer at 10am and all of a sudden it’s 6p and all I’ve done is explore my various “offers”. Thanks for such a relevant and timely article! Thankyou for the interesting blog on buying products.It was very helpful.I just wondered if you knew of a site that actually buys a new product,tries it out for a week or so and then gives an honest review of it,even while it is still up for sale. I have been trying to decide whether to buy the latest software package :Auto Mass Traffic. I am doing this very thing right now. I am buying products and working with DOE members to test those products (they do the work, I pay the bills) and then reporting results. But one week is not nearly enough to know how something is going to work. You will likely encounter upsells on most products online. They are very effective and marketers love them. I do not use them nor do I intend to use them because I want customers KNOWING what they get up front. That said, you can always say no to the upsell as you point out. When I get up and running (and have some cash), I will subscribe to your business. I perceive I can trust you, and want to take advantage of your resources to place ads. I appreciate your articles and advice, like this one “5 Ways To Spot A Great Product”. Good advice. I like your way of speaking, relaxed, comprehensive, slow and articulate, reassuring, and deliberate. I hope I can be up and running soon to take advantage of your lifetime membership. Being a Newby and inexperienced I’m especially looking forward to getting your experienced advice concerning my direction and needs for a sustained and solid foundation in growing my business. Being 68 and disabled my MO will be like the tortoise in Aesop’s Fables of the race between the “Tortoise and the Hare”, slow, but sure. I feel I can be confident in the services of your business, and your advice. Looking forward to meeting and talking with you. Thank you, Bill Warren at warren3165@comcast.net. hello sir i just wanna know if i buy a product and they say” if it does not work i’ll pay you 100 dollars out my own pockets and your refund” are they for real? That’s hard to answer since I don’t know to whom you are referring. I would say to check them out and see if they have done this and if they seem to be for real using other methods like forums. Oh Charlie, thank you !!! this is all so true and it’s so good you’re talking about ! And searching alone is often difficult – and often, instead of asking someone , you think you maybe could learn more from somebody else on internet…….. and you’re hoping they will do the work for you ! ? Instead of getting into action, you ‘re reading again in some sales letters: “how to act and what to do – and it does not help….! ………. as long as you do not “act” ! Thank you, Charlie, for these good advices! Very helpful ! it’s so true that there is no ending with all the offers in internet – and one day you just need to get started to find out what is best for YOU – and to find somebody like you, Charlie, is very rare! – and a bi gift ! Because you have so much experience ! You are most welcome. Let me say in reply that I often have an assistant return a call or email for me when time does not allow. My assistants are very well trained and I follow up with them to make sure the person asking the question is satisfied. But using assistants is the only way to leverage time and I don’t fault anyone for using them. thank you for the five. Here’s your first comment! Today Charlie my head was about to burst, so much in fact that I pulled down the screen on my laptop, held my head between my legs let out a roar & went and made myself a cup of tea. The weired thing is, as soon as I drank my tea I jumped right back into it! Charlie as you can see from my site (built it from scratch by the way) I’m a plumber to trade but I’ve always been drawn to Internet Marketing, don’t know why! I was never involved in it! None of my family or friends have done it! But every time I come across a great product I want to get Involved in it and start making money with it. Then they open the flood gates & start trying to sell you something else that can help you sell that product & so on & so on, Then I lose faith and just stop in my tracks were would you go from here? about their home business. If they can’t be answered by the sponsor or thru your own due diligence, run for the hills! Once again you have provided wonderful and much needed information! I will be sure to keep this at my side anytime I am deciding whether or not to purchase a product. Thanks Charlie for another great post. It is so true that we are in a world of information overload and it can be difficult choosing the right product. I would also recommend doing as much research about the product and the person you are buying from, don’t just rely on the testimonials on their site but Google them too. and have turned to Internet Marketing for the time being. Hopefully one day I will buy your DOE because I personally think it would be a great investment. You don’t use HYPE in your marketing and you seem to be down-to-earth. Two things I admire about you. Have a great day!